Josh Hart celebrates a play against the Oklahoma City Thunder on Feb. 8, 2018. The one word never associated with the Lakers: boring. On and off the floor, the Lakers keep it interesting, from unique skill sets and backgrounds to off-court chemistry and the latest kicks. Here’s a quick run-through of another week with the Lake Show. Brandon Ingram is in the hottest 3-point-shooting stretch of his young career. The sophomore has drilled nine of his 11 attempts from deep over the last three games, and is now up to 39.3 percent across the entire season. Part of the reason for Ingram’s success has been the quality of the looks he has been taking — all catch-and-shoot attempts that he might have passed on earlier this year. Coach Luke Walton also thinks that Ingram’s hot hand has to do with his role as the team’s point forward. According to Walton, it helps shooters when they are engaged in other aspects of the game, and Ingram has been constantly busy between directing the offense, defending opposing point guards and his many other responsibilities. Speaking of Ingram, the Lakers have devised a crafty way of getting him to the basket using an old play they used to run for Marcelo Huertas and Lou Williams last year. It’s a simple action, as Julius Randle or Kyle Kuzma posts up far from the basket while Ingram saunters into the lane. With the ball out on the perimeter and Ingram jogging nonchalantly, the defense tends to fall asleep, and all that’s left is a pinpoint pass and easy finish at the cup. Becoming a Laker has special significance for Isaiah Thomas. In fact, Thomas’ name even has origins from his family’s fandom. In 1988, his father, James, bet his close friend that the Lakers would beat the Detroit Pistons in the NBA Finals. When the purple and gold lost, James had to name his son “Isaiah,” in reference to Pistons star Isiah Thomas. Ironically, a month before being traded to the Lakers, Isaiah posted an Instagram tribute to his pops. And what’s that James is wearing? A Lakers cap and a Magic Johnson jersey. One of the most impressive aspects of Luke Walton’s coaching is his ability to draw up 3-point looks for his shooters. In particular, he has done an impressive job of putting stretch center Brook Lopez into ideal situations. 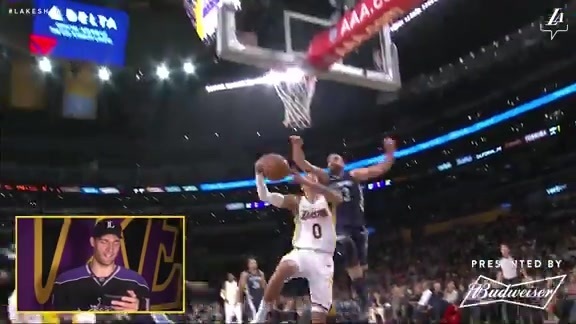 Below is a fine example of the, as Kentavious Caldwell-Pope acts like he’s going to use a baseline screen from Ingram before faking like he’s going around another pick from Lopez. But it turns out KCP was the screener the entire time, as he leans on Dallas’ center while Lopez pops out for the triple with nobody even close to him. Luke's doing a nice job of getting his guys clean looks. KCP acts like he's using Ingram's pick, then fakes like he'll use Lopez's. Turns out KCP is the screener all along, as he leans on Dallas' center while Lopez pops out for the wiiide open 3. 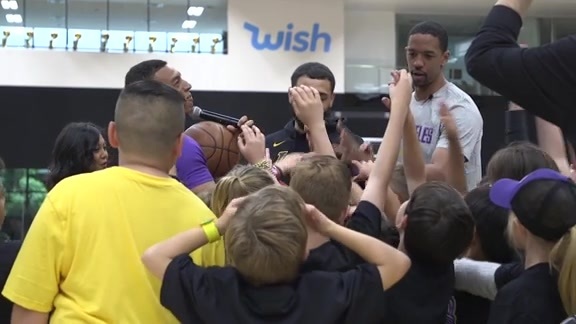 Recently traded alongside Thomas, Channing Frye made sure to get a lift in when NBA TV visited the UCLA Health Training Center during his first practice with the Lakers. But Frye’s former teammate from Cleveland, Dwyane Wade, put his guy on blast by saying it’s all for the cameras. Frye took it in stride, acknowledging the need for a beach bod in the South Bay.